At this year’s Rencontres de Moriond, the ATLAS collaboration presented the first results examining the full 2015 and 2016 LHC data at 13 TeV proton–proton collision energy. Thanks to outstanding performance of the CERN accelerator complex last year, this new dataset is almost three times larger than that available at ICHEP, the last major particle physics conference held in August 2016. The significant increase in data volume has greatly improved ATLAS’ sensitivity to possible new particles predicted by theories beyond the Standard Model. At the same time, it has also allowed ATLAS physicists to perform precise measurements of the properties of known Standard Model particles. A selection of Moriond 2017 highlights are explored below; find the full list of ATLAS public results here, with recent Run 2 results here. Supersymmetry (SUSY) has long been considered a front-runner for solving a number of mysteries left unexplained by the Standard Model, including the magnitude of the mass of the Higgs boson and the nature of the dark matter. Among the key new results presented at Moriond were the first searches for SUSY particles using the new dataset. These new ATLAS results, along with those from the CMS experiment, provide the most challenging tests of the SUSY theory carried out so far. Searches for “squark” and “gluino” particles decaying to Standard Model particles revealed no evidence for their existence, and have set limits on the masses of these particles which extend, for the first time, as high as 2 TeV. Searches for “top squark” particles, the existence of which is crucial if SUSY is to explain the mass of the Higgs boson, also found no deviations from expected Standard Model processes. A new search for long-lived “chargino” particles was also presented. This search utilizes the Insertable B-Layer (IBL) detector installed during the 2014 LHC shutdown. The IBL is a new piece of ATLAS charged particle detection hardware as close as 3.3 cm to the LHC beam pipe. The new search looks for ‘disappearing’ tracks created by charginos traversing the IBL before decaying into invisible dark matter. No evidence for such tracks was found, significantly constraining a large class of SUSY models. An alternative search for new long-lived particles decaying to charged particles via the signature of displaced decay vertices also found the data to be consistent with Standard Model expectations. 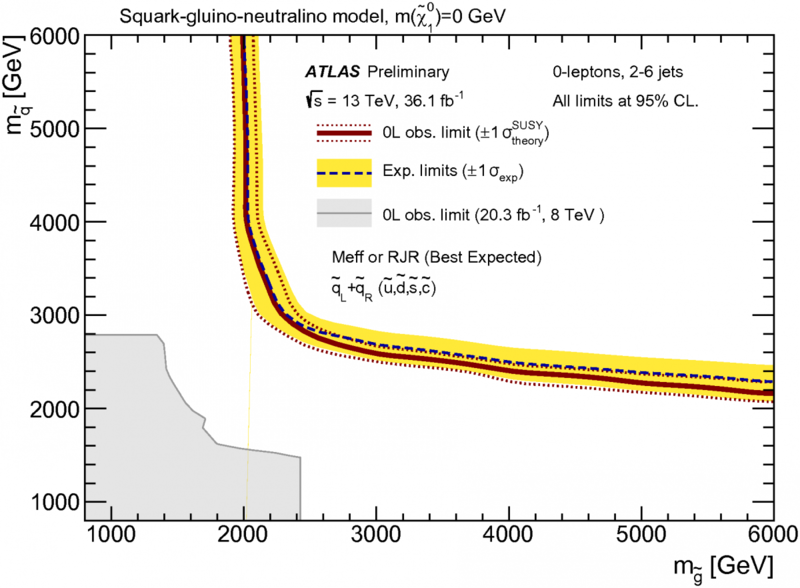 The significant increase in data volume has greatly improved ATLAS’ sensitivity to possible new particles predicted by theories beyond the Standard Model. In addition to searches for SUSY particles, ATLAS reported a number of new results in the search for “exotic” forms of beyond the Standard Model physics. Searches for new heavy particles that decay into pairs of jets (thus sensitive to a possible quark substructure) or to a Higgs boson and a W or Z boson set constraints on the masses of these exotic new particles as high as 6 TeV. Searches for the production of dark matter particles were also reported. These look at events in which Standard Model particles, such as photons or Higgs bosons, recoil against the invisible dark matter particles to generate an eve­­nt property called missing transverse energy. Again, the data were consistent with expectations from Standard Model processes. In addition, a search for a heavy partner of the W boson (a W’ boson), predicted by many Standard Model extensions, was carried out with the new dataset. In the absence of evidence of a signal, the search has set new limits on the W’ mass up to 5.1 TeV. Following the discovery of the Higgs boson in 2012, a major component of the ATLAS physics programme has been devoted to measuring its properties and searching for rare processes by which it may decay. These analyses are crucial to establish whether the Higgs boson observed by ATLAS is that predicted by the Standard Model, or if it is instead the first evidence of new physics. 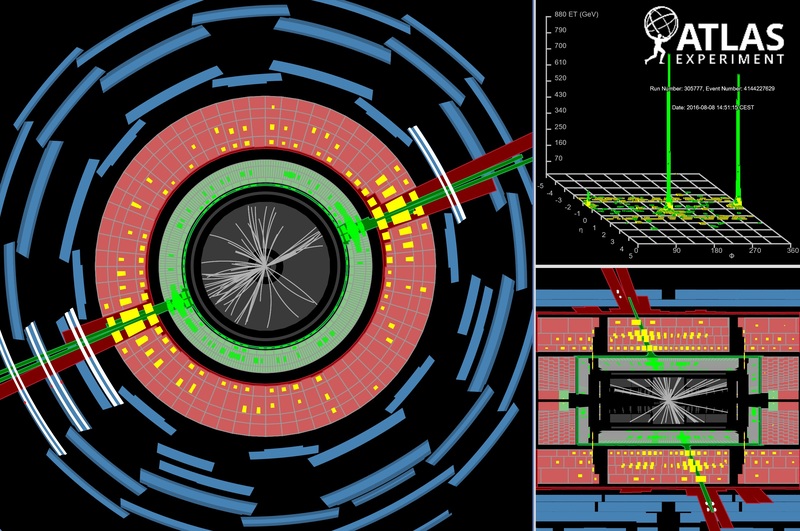 The ATLAS collaboration presented a new search for a rare process where the Higgs boson decays to muon pairs. Observation of this process above the rate predicted by the Standard Model could provide evidence for new physics. No evidence was seen however, allowing limits to be set on the decay probability of 2.7 times the Standard Model expectation. That limit probes (and proves) the fundamental Standard Model prediction of different Higgs boson-to-lepton couplings for different lepton generations. ATLAS presented precise new measurements of the production and properties of known Standard Model particles. Analysing Run 1 data, the ATLAS Collaboration presented a number of measurements of the production and properties of known Standard Model particles. Among these was a major milestone result for the LHC programme: the first measurement of the W boson mass by the ATLAS experiment. Measured with a precision of 19 MeV, the result rivals the best previous result from a single experiment. The measurement provides an excellent test of the Standard Model via so-called virtual corrections through the interplay between the W boson, top-quark and Higgs boson masses, all precisely measured by ATLAS. Another key new result was a measurement of the decay properties of Bd mesons decaying to a K* meson and two muons. The LHCb and Belle collaborations had previously reported evidence of an excess above Standard Model expectations in one particular decay parameter, P5’. The new ATLAS measurement also provides evidence of a modest excess, albeit with significant statistical uncertainties. Analysis of the new dataset should enable a clearer picture of this process to be obtained. In addition, ATLAS presented precise new measurements of the production and properties of photon pairs in 8 TeV collisions. This result represents an important addition to our understanding of quantum chromodynamics (QCD), the Standard Model theory of the strong force. While no evidence for new physics has yet been found, these new results have provided crucial input to our theoretical models and has greatly improved our understanding of the Standard Model. We can look forward more results using the new dataset in the coming months. What is more, with the LHC set to continue its excellent performance in 2017, ATLAS can expect even greater sensitivity in results to come.